Daniel House caught up with Vikings cornerback Derek Cox and learned more about what led him to Minnesota in free agency. Derek Cox was signed in the off-season in an effort to bolster a depleted Vikings secondary. He spent four seasons with the Jacksonville Jaguars and signed a 4-year $20 million contract with the San Diego Chargers last season. He was released following the 2013 season and was benched twice during the year with the Chargers. Cox is looking for the opportunity to flourish in Mike Zimmer's defensive scheme and is having a great time in Minnesota for Vikings training camp. "It has been pretty good for me. No humidity, experienced plenty of that, so practice has been good. I'm having fun," Cox said. 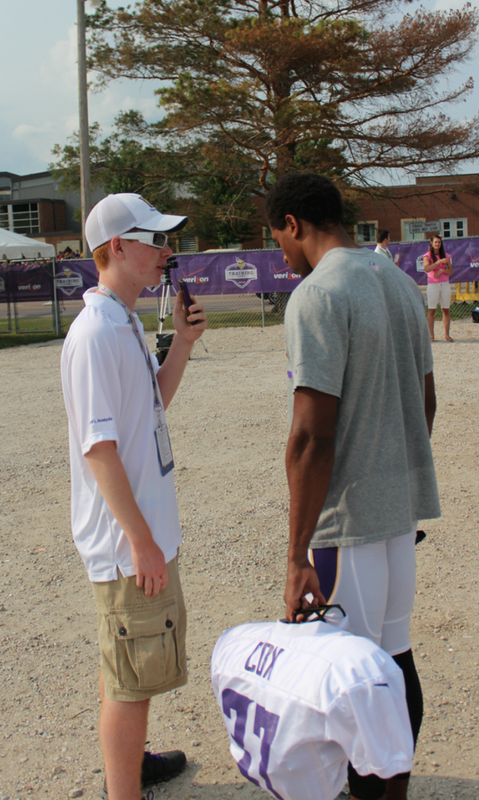 Cox believes he will flourish playing in more press coverage with the Vikings. He likes the way it can lead to turnovers, while linking the pass rush and coverage together. In turn, these methods will help create opportunities for the cornerbacks to make plays in the secondary. "I like it and I think that getting close to guys is how you want to play the game because when you can get a rush and coverage working together, that's when you get some hits on the quarterback, that's when you get some turnovers on defense," Cox explained. Cox says the secondary is very lucky to have a defensive backs coach with a pedigree like Jerry Gray does. The biggest thing the defensive backs like is the first-hand experience that he can provide. Gray played in the league and can directly relate to what the players are feeling on the field. "It's great, because he has played professionally, so he can relate and give us tips that he has taken directly from the field. I'm a technique guy, so focusing on the technical side of the game is huge and it allows us to definitely be sound and puts us in the position to make plays," Cox added. Cox mentioned how much he loved the weather in Minnesota and the low humidity levels, but the only pest he doesn't like is the mosquitos. That opinion may change when the wind is howling through TCF Bank Stadium, but Cox hasn't experienced a harsh winter yet. "You know what, so far it has been the mosquitos. They eat my life alive whenever she is out walking the dogs. I don't know, it must be the lakes, there is a lake right behind my house. Enjoying Minnesota, I love it, especially Minneapolis," Cox said. Cox doesn't reveal his personal goals, but one thing he always focuses on is improving his game. He wants to continually makes strides with his game, while taking the steps necessary to be successful. "Always, it's a focus about getting better. The general focus is about getting better and continually progressing and getting further as a player each and every year," Cox concluded.